Find Art Deco tiles in our online art tile catalog. See the many tile designs and patterns for Art Deco style in our SQUARE TILE COLLECTION and our GEOMETRIC BORDER TILES There are many other ideas and photos throughout our catalog. 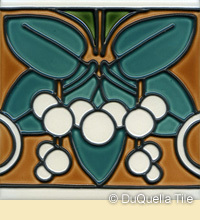 Many of Arts & Crafts and Art Nouveau patterns work with Art Deco style when appropriate glaze colors are used. Art Deco, an architectural and design style developed in the 1920s, has not lost its appeal in the more than 85 years since its inception. A striking art form characterized by geometric patterns, pointed designs, and bold hues, the Art Deco aesthetic is both beautiful and unique. This multifaceted decorative style has been utilized in all sorts of artistic platforms, including jewelry, architecture, interior design, and haute couture (to name a few). Start your exploration of our Art Deco tile in our square tile collection! Here at DuQuella Tile, we continue to be amazed at all the magnificent and distinctive forms of Art Deco expression. Subsequently, we are proud to offer our customers one of the largest collections of hand crafted Art Deco decorative tiles in the country. Inspired by one of history's most fascinating eras, our tiles allow contemporary art enthusiasts a rare taste of the past. Our customers love our Art Deco tiles because they can be used throughout the index. They can be used in kitchen backsplashes, living rooms, fireplace surrounds, bathroom shower walls, and more. Additionally, they can also be purchased individually as gifts. Because each of our tiles is hand crafted and made to order, there is no minimum requirement. Whether you want one tile or 100, we value each and every order. 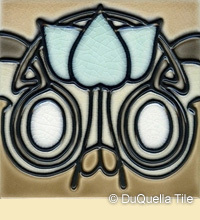 DuQuella Tile is your studio for Art Deco-inspired decorative tiles. For more information about the tiles available here at DuQuella Tile or if you would like to speak to someone about commissioning a custom order, EMAIL US or call Toll Free 1-866-218-8221 today. We can also work with you to help determine the layout of your chosen tiles.